Give Music. Change Lives. It All Begins with Music. From Kindergarten Through College, We Keep Kids Safe, in School, and Inspired. Creativity. Teamwork. Confidence. We Commit to Children Through Their Entire Childhood. Margaret Martin, a mom, domestic violence survivor, and formerly homeless woman, founded Harmony Project in 2001. She saw music as a way to calm a brain traumatized by poverty, violence, and societal neglect. ​Their goal is big: To promote the healthy growth and development of children through the study, practice and performance of music; to build healthier communities by investing in the positive development of children through music; to develop children as musical ambassadors of peace, hope and understanding among people of diverse cultures, backgrounds and beliefs. 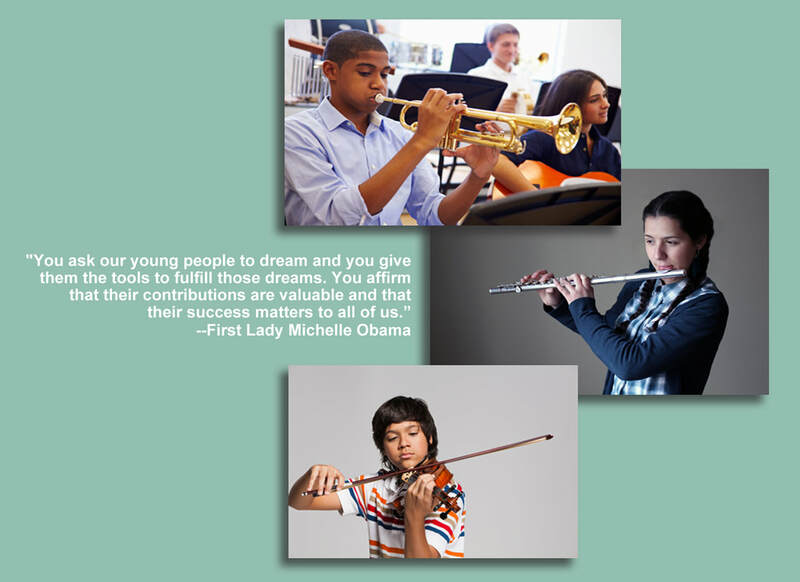 At first glance, their mission statement seems lofty and slightly impossible, but the more you study what they’ve accomplished, the more they are right on target with their goal: “We are LA’s largest music education non-profit!” Harmony Project isn’t shy about boasting. They have lots to boast about. As board member David Steward informed us, most of their kids go onto college. The actual number at this point is 93%. Wow! That’s incredible. Each Harmony Project student receives a cherished musical instrument to enjoy while in the program, and more importantly to take home. That act alone builds confidence, a sense of responsibility, and is a giant builder of self-worth. Each student receives five hours of music lessons weekly and participates in an orchestra— no matter the instrument, age or skill level—and they perform concerts at community events throughout the year. Students and teachers check in regularly with one another, one-on-one, to ensure success. Harmony Project provides field trips to concerts and cultural events. Parents and guardians are included along the way, and if families can benefit from other social services, Harmony Project is happy to make the connections and introductions. As if all of this isn’t enough, college scholarships are awarded to worthy graduates. Ensuring success for any nonprofit means keeping statistics and doing the research, and since their inception in 2001, Harmony Project does just that. They have been involved in numerous studies to better help their students, including one working with Northwestern University. 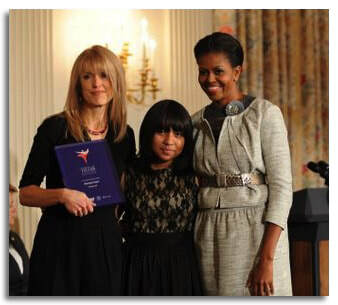 Harmony Project Founder Margaret Martin with one of her students Kiana Coronado-Ziadie receiving the Coming Up Taller Award in 2009 from First Lady Michelle Obama. We know from experience that long-term engagement with music is good for kids. We’re also interested in the science explaining the cognitive benefits of music, which is why we’ve teamed up with researchers at Northwestern University to uncover how Harmony Project changes a child’s brain. The team from Northwestern found that kids who studied music at Harmony Project become better listeners, which will improve their reading skills as well as their ability to focus in a noisy classroom. According to lead researcher Nina Kraus, music may play a crucial role in closing the academic achievement gap between affluent and low-income children. Not surprising, given their results, Harmony Project is receiving acclaim and much deserved awards. In 2009, Harmony Project was honored by President Obama with the Coming Up Taller Award, our nation’s highest honor for a youth humanities program. Harmony Project strives to provide free music lessons for underserved kids from kindergarten through high school. The program is so popular it now has a two-to-four year waiting list. Founder Margaret Martin is working overtime to expand the program and KABF is thrilled to be a part of it. As Kelly’s brother said, it’s so Kell. Read more about Harmony Project here.